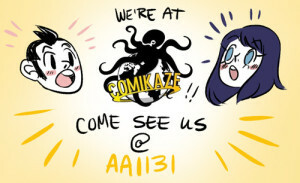 We’re gonna be at Comikaze in Los Angeles this weekend! Stop on by, we’ve got books and buttons and posters and other totally cool stuff. Check it out!!! Did you guys know that Chapter 15 is the last chapter of Galacticat ever? Yep, it’s wrappin up in one more chapter. Wallace and Elpy’s story is almost over. We’ll keep you updated on the fate of us and this comic (further book releases, con appearances, etc) as it gets closer to its inevitable end! 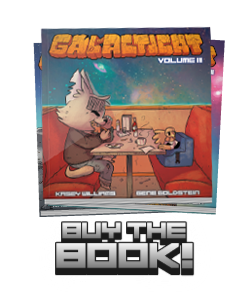 Volume 2 is now in the Galacticat Store! Like the first volume, it’s available on both Amazon and Createspace (our publisher), but we get a higher cut of the profits from Createspace. Grab a copy if you liked chapters 5-10! We appreciate the support! Don’t forget, we’re gonna be tabling at Emerald City Comic Con in Seattle! 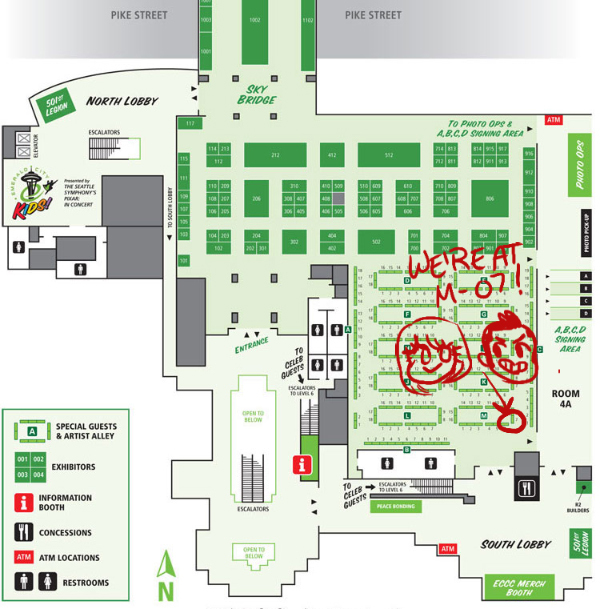 Come visit us, our table number is M-07. We’re on the south side of the convention hall, by the bathrooms. Hope to see you there! I’m sure you guys have noticed that updates have been a little sporadic lately- I’ve recently started a full-time job, which is great, but sorely cuts into my comic-making time. So rather than surprising you guys with updates on random days, the post schedule is hereby switching from Monday-Wednesday-Friday to just Monday-Friday. Even though that’s one less page a week, that means fewer pages being drawn while I’m half asleep (or not at all)! Quality pages, horray!